As the name implies, these diseases result in the formation of spots or blotches on plant leaves. Some are circular and others will be irregular or blotchy in form and of various sizes and placement on the leaf. These specifics will help in the identification of the specific disease involved. Typical of plant problems, many leaf spot diseases are specific to a genus and may not occur on any others. There are also several organisms including fungi, bacteria and insects as well as environmental factors that can cause spots on leaves. Fungal Leaf Spot: Spots caused by fungi are often small and circular and may be found on all the leaves. Sometimes only the older or younger leaves are affected. The spots range in size from barely visible to ¾ inch in diameter. They may be yellow, red, tan, gray, brown, or black and often have a definite margin. Spots sometimes join together to form blotches. Often the leaves turn yellow and die. Infection is usually most severe during moist, mild weather (50° to 85°F). Bacterial Leaf Spot: Much less common than fungal leaf spots, a few bacteria also cause spots on ornamental plants. 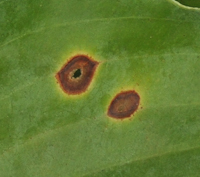 The symptom on the leaf is usually a circular lesion with a "halo" of lighter colored tissue around it. Insects: Critters that feed on the top layer (epidermis) of the leaf often leave damage in a spot-like manner. Lacebugs, leafhoppers, spider mites, plantbugs and thrips all leave damage signs that appear as spotting on plant leaves. Perhaps the most common damage is done by the four lined plant bug which infests many herbaceous perennials. This true bug has a circular mouth and it takes a roundish bite of the epidermis of leaves. Its spittle is phytotoxic and kills the surrounding tissue leaving a black spot. Several individual spots will sometimes spread together making it look like a larger blotch. To the uninitiated, the damage looks like some type of leaf spot disease rather than insect feeding. Physical Damage: Leaves may be damaged by excessive, hot sun or by cold temperatures. Sunburn and frost damage may both present themselves as spots on the leaves. Both kill individual cells in the leaf and, if enough are killed, they may form together into larger blotches. Resistance - Some species and cultivars within a genus may be less susceptible or may be resistant to leaf spot diseases. 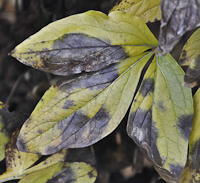 Water - Most leaf spot diseases are fungal which means that they can be encouraged by providing the moist or wet environment needed for the fungus to grow and reproduce. So, for plants that are susceptible, avoid watering onto the foliage in late afternoon or evening so that the foliage goes into the night wet. Also, provide plenty of air movement around such plants to allow them to dry faster after rain or dew. Chemical Controls - Fungicides, both organic and inorganic, may be used to prevent fungal leaf spots. The timing and type of fungicide will depend on the specific disease that is diagnosed.